The box set comes with 48 plastic Panzergrenadiers. The figures make six MG teams with optional panzerfausts. The command stand can be built with either a Panzerfaust or a Panzerknacker and has a figure with an SMG. Some of the Panzergrenadier models are the same as the Open Fire figures. The set contains two sprues and so each box has two of each figure. The figures are very nice overall. A few of them have very elongated helmets. The infantry come with seven recessed bases. 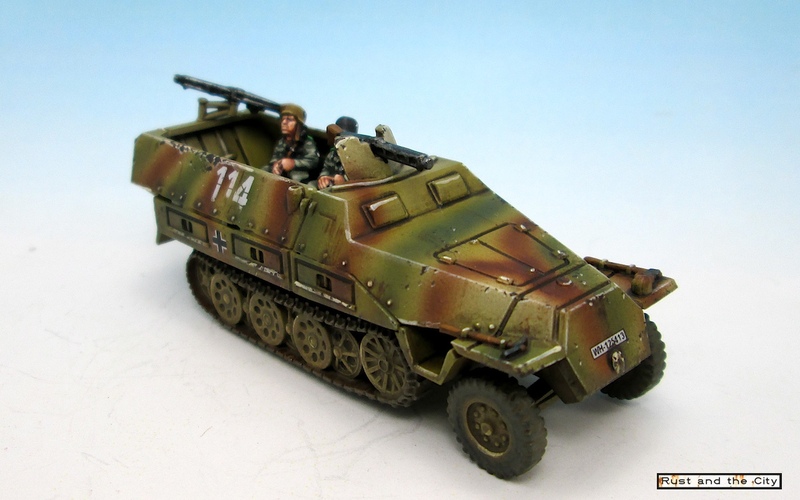 My only compaint with the Panzergrenadiers is that they do not include a Panzershreck or Tank Hunter team (as this is available in most late war lists). 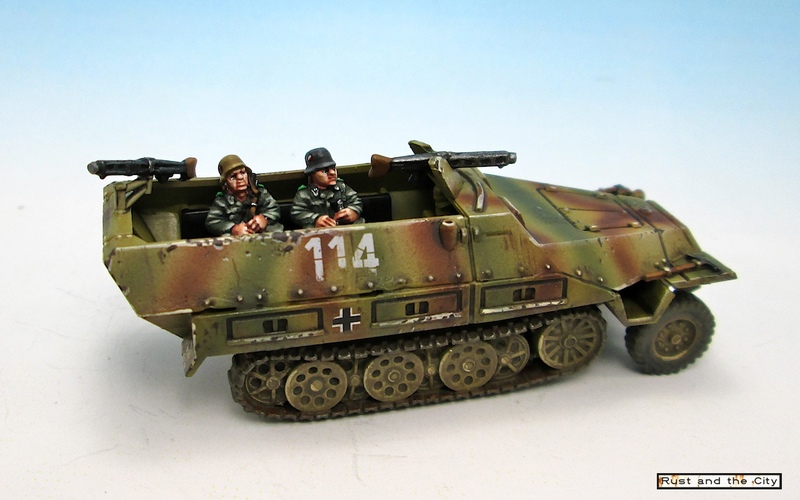 The soon to be released plastic Panzergrenadier Command set contains one panzerschreck team. It would have been easier if one or two panzerschrecks were also contained in this set. The box set includes four identical crew sprues with a machine gunner, driver, commander, and two seated panzergrenadiers. This combination will allow you to build a variety of different arrangements but may get a bit repetitive over an entire company. Hopefully the Panzergreandier command boxset contains another unique crew sprue but I think we may be stuck with just the two poses for seated crew. 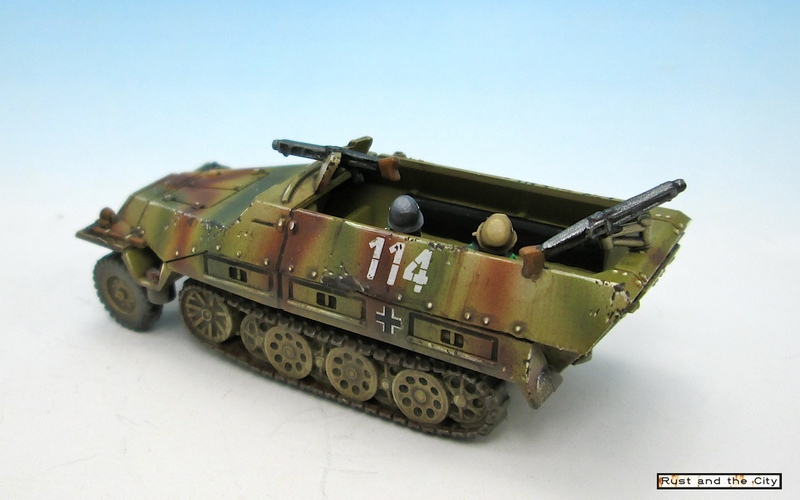 Fortunately with plastic panzergrenadiers it is not too difficult to remove the base tabs from the regular panzergrenadiers and glue them into the half-tracks. The crew look great. I just wish there were more than 2 different seated crew. How about one with a camouflage poncho on! Each box set contains a set of half-track decals. The decals include both front and back license plates for Heer half-tracks. The decal set also includes division markings for 17 Panzer Division, Herman Goring Panzer Division, and 116 Panzer Division. The decal set includes both black and white and white Balkenkruz decals. Finally, the decal set comes with numbers 311-314 for numbering each half-track. The decal set seems to have no alignment issues. It is nice that they included some new divisional decals. The only issue is that you may want another source of decals if you want different numbers for each platoon. (Note-I used Dom’s Decals on this model, not the included decals). The half-track sprue is well designed and assembles easily. The first model took me under 20 minutes to assemble following the instructions on the Flames of War website. I anticipate that I could assemble a platoon in under an hour (note that I am very slow at assembly as I am a bit of a perfectionist). The pieces of the model fit together snugly and accurately. The wheels and tracks align perfectly with no wobble on the assembled model (something that bothers my perfectionist nature on the resin models). I love how stable the model is with the more precise front wheels. The trickiest part of the assembly is attaching the upper hull to the lower section as it is a bit fragile and flexible. This can cause a bit of a gap on the sides. Doubtless, with practice and careful assembly this can be elimininated. You can see the gap at the bottom of the top panel on the side. The sprue attachment points are thoughtfully placed to minimize assembly issues. For example, on the tracks the sprue attaches on the inside of the track so the visible parts of the track are unblemished. The mould lines are thoughtfully placed and almost invisible. The only mould lines that possibly need removing are on the machine guns and on the rear part of the hull. The models are made of the darker, hard grey plastic like the track sprues on the new Shermans, Panthers and Panzer IV Js. Track detail is exceptional. The sprue connection points and mold lines are very well placed. The sprue contains options to build both a standard 251/1D, pioneer bridges to make pioneer specific half-tracks (I think there are some other small internal differences? 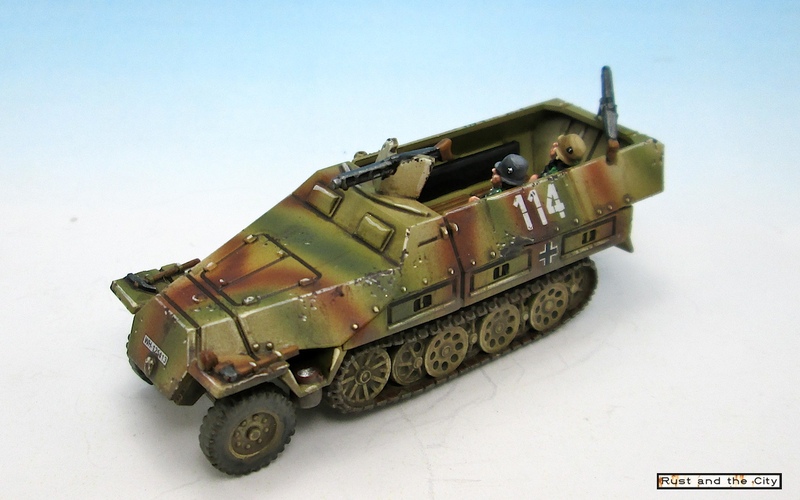 ), and a Pak36 for the command half-track. It would have been nice if the box set included some additional stowage to add more variety to the half-tracks. I ordered the metal half-track stowage separately to add more variety to my company. At USD 45 per box set, the Panzergrenadier box set represents a good discount on the previous resin and metal box set at USD 58. This works out to a 22% reduction in price. It is hard to complain about a reduction in price for an arguably superior product. I think that this box set represents excellent value and competes with other plastic model manufacturers on price point. In conclusion, the Panzergrenadier box set is a great new addition to the Flames of War model range. The plastic Panzergrenadiers a crisp sculpts in a good selection of poses. 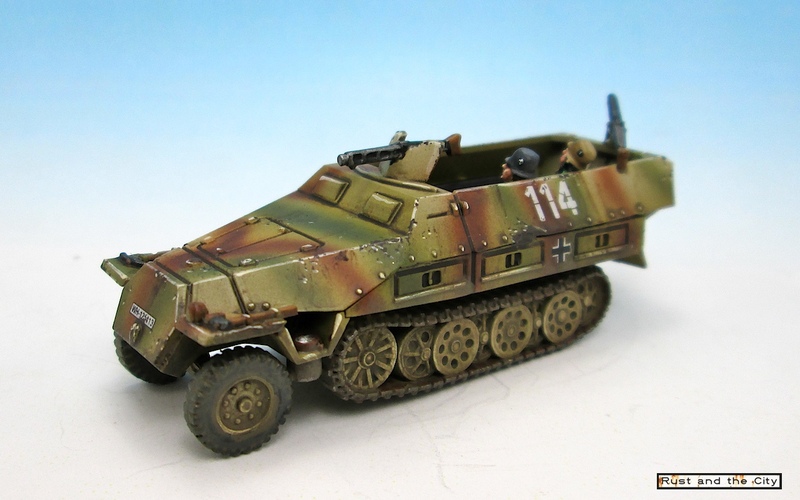 The plastic half-tracks crews will fit in well with the Panzergrenadiers. The half-tracks are relatively easy to assemble with very crisp and clean details. The decal set adds some nice options for some different divisional insignia. 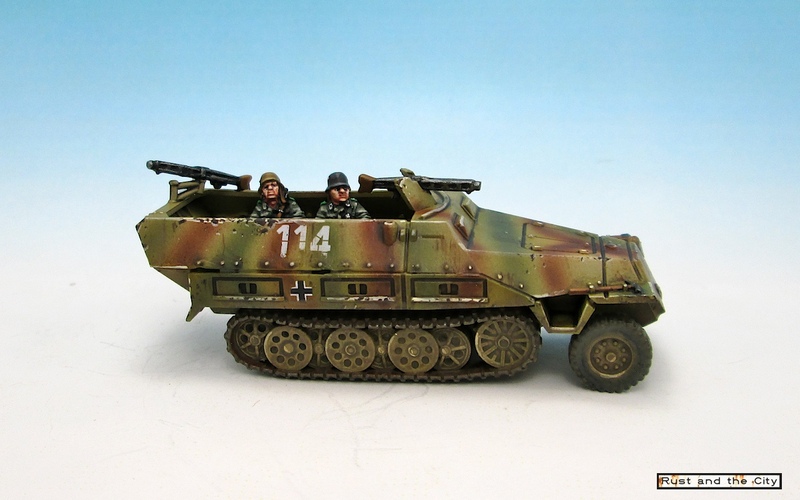 My biggest complaints are the lack of panzerschreck/tank hunter teams and the lack of variety in the half track crew. Finally, the price decrease for the new plastic box set makes this box set exceptional value. I'd like to provide your painting a rating of 5/5. I am really inspired by your work, and look forward to each of your posts. Having tried and failed to do cammo at this scale, I am really impressed with how yours turned out. Thanks John. It means a lot. I'm still experimenting a bit with the camo. It is tricky. My airbrush is having issues at the moment. The airbrush makes camouflage a lot easier though. I'm with John, on all counts! I agree about the british armoured infantry. The motorised platoons are too small! The infantry in roos are pretty great though. .50 cals and good armour are awesome. Sadly 11th ad doesn't get them. I'm planning on buying this PzGren box for my Kampfgruppe Arnhem list. Doubt my own paint jobs (When I get to them, that is) will be anywhere as lovely as your's, but I'm looking forward to giving it a shot! Thanks for posting the thorough review mate - will you do similar for the HQ box too? Thanks Dai. Those infantry in ram roos and sherman roos are pretty awesome. Very survivable. I'll do a review for the command box when I get it and paint it too. I may just paint up the infantry stands right away as I want to airbrush all 11 other half tracks at the same time for uniformity. A guy I play with runs this fairly successfully. It's just too bad there isn't an 11th list. If you are like me, I hate running my 11th AD models as anything but 11th AD.